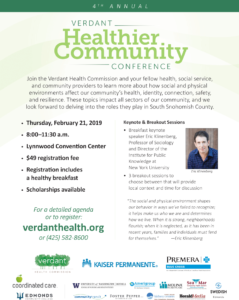 Join the Verdant Health Commission and your fellow health, social service, and community providers to learn more about how social and physical environments affect our community’s health, identity, connection, safety, and resilience. These topics impact all sectors of our community, and we look forward to delving into the role they play in South Snohomish County. View the agenda overview below, or jump to detailed descriptions of the keynote and breakout sessions. Cost: $49 per person. Registration includes a healthy breakfast. Scholarships are available. Download the conference scholarship form for details or to apply for a scholarship. To register, visit the Eventbrite registration website or contact us at (425) 582-8600 with questions. Online registration ends Tuesday, Feb. 19. Registration at the door may be available, space permitting. Each of the following interactive breakout sessions will look at how organizations in our region use space to increase interpersonal connections and shape behaviors. The facilitated conversations will include an examination of strengths, weaknesses, and lessons learned as well as takeaways that participants can apply to promote individual and community health. In this keynote, Klinenberg will highlight how inequality and division are affecting our society and offer a way forward, with particular emphasis on what he describes as “social infrastructure.” When it is strong, neighborhoods flourish; when it is neglected, as it has been in recent years, families and individuals must fend for themselves. He believes that the future of healthy societies rests not simply on shared values but on shared spaces: the libraries, childcare centers, bookstores, churches, synagogues, and parks where crucial, sometimes life-saving connections, are formed. These are places where people gather and linger, making friends across group lines and strengthening the entire community. The impact this has on the social determinants of health is tangible, and we will dive into examples to learn more about what’s working in other communities Klinenberg has researched. Eric Klinenberg is Professor of Sociology and Director of the Institute for Public Knowledge at New York University. He is the author of Palaces for the People: How Social Infrastructure Can Help Fight Inequality, Polarization, and the Decline of Civic Life (Crown, 2018), Going Solo: The Extraordinary Rise and Surprising Appeal of Living Alone (The Penguin Press, 2012), Fighting for Air: The Battle to Control America’s Media (Metropolitan Books, 2007), and Heat Wave: A Social Autopsy of Disaster in Chicago (University of Chicago Press, 2002), as well as the editor of Cultural Production in a Digital Age and of the journal Public Culture. His scholarly work has been published in journals including the American Sociological Review, Theory and Society, and Ethnography, and he has contributed to The New Yorker, The New York Times Magazine, Rolling Stone, Time Magazine, Fortune, The Wall Street Journal, The Nation, The Washington Post, Slate, Le Monde Diplomatique, The London Review of Books, and the radio program, This American Life. Places and spaces can build a strong community identity, and in this session, we will discuss several regional examples from parks, libraries, and the arts. The session will include discussion on how the morning keynote from Eric Klinenberg affects our own South Snohomish County identity. A strong social infrastructure provides space to create connections across and between different populations within our community. In this session, hear examples of how families with children connect with each other and with our public schools, how our workplaces can foster connections between employees, and how a group of otherwise disconnected individuals can gather together around one common need and learn from one another. This session will also include reflection on how the messages from morning keynote speaker Eric Klinenberg transfers to South Snohomish County, with a focus on creating connection. In this session, we will look at strategies used by programs in the Puget Sound area to foster relationships between diverse and varying populations with the goal of increasing safety and both individual and community resilience. These examples will include strategies in use for caregivers, businesses, police, faith communities, vulnerable populations, and homeless individuals. This session also will include time to discuss how the messages from keynote Eric Klinenberg connects with safety and resilience in South Snohomish County.